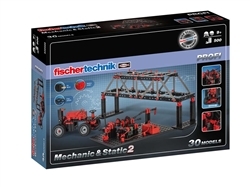 fischertechnik Mechanic and Static 2 is the definitive technical construction set for future engineers and technicians. This comprehensive set explores how a shaft drive and/or manual transmission work; demonstrates the function of a planetary gear; and allows you to design a stable bridge. 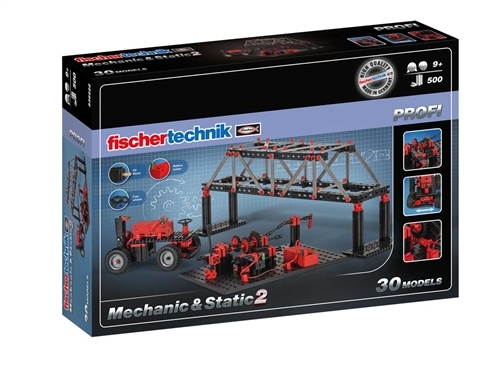 fischertechnik encourages young builders to learn a range of basic mechanical concepts, while assembling over 30 versatile models. Discover the principles of technology through play! The fischertechnik Mechanic and Static 2 set provides access to the fischertechnik eLearning portal, which contains exciting, instructional activity information, videos and tutorials. With 500 fischertechnik parts, young builders can construct one of 30 different models as they explore mechanics and statics concepts. Follow the detailed, step-by-step instructions to complete each model. 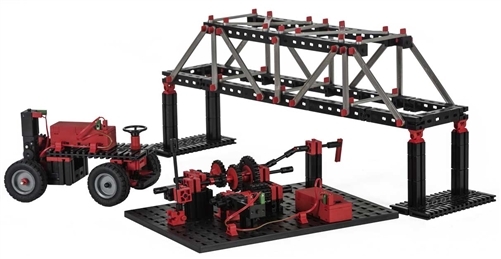 Like many fischertechnik sets, young engineers are also encouraged to use what they've learned from the models to create their own designs. Use the 500 fischertechnik parts to design something new!